Hacton Cruck, in the parish of Preston-on-Wye, would most likely have started its life looking very much as it does today. A ‘Hall House’ of some importance dating from the late C14th or early C15th century, it sat on the edge of the village of Ploughfield (which later came to be known as Preston-on-Wye). It would have been home to a man of some standing and ambition, perhaps a prosperous yeoman farmer, his family and servants. 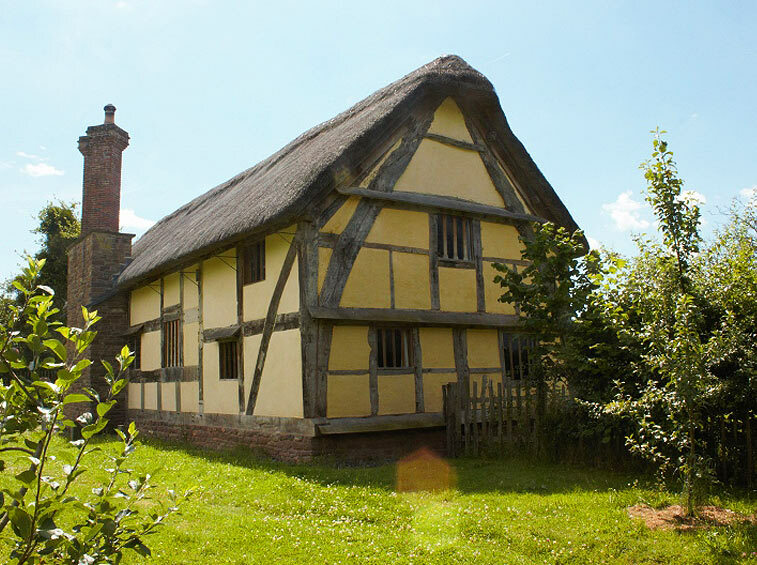 It consisted of a substantial well-built timber frame of three or four bays. At the ‘upper’ end, the owner’s comfortable private rooms, in the middle two bays, the large open hall – a communal space where the master and his servants took meals and entertainment together, and possibly at the ‘lower’ end service rooms where food and drink were stored and prepared. The surrounding countryside could well have looked familiar too, for the Domesday Book, as well as noting that Ploughfield was granted a Royal Charter to hold a market, also recorded it as having ten ploughs. It was likely that the surrounding land was cultivated and broken up by pockets of woodland. The smoke blackened rafters around where the smoke hatch was, the infill panels too were blackened. In the late C16th early C17th, with England’s growing prosperity, the house would have been modernised. The open fire, in the centre of the hall, that filled the house with smoke and blackened the roof timbers, (which remain in that state) was replaced with a fireplace and chimney. Without all the smoke, a first floor could be inserted to create more living space. Perhaps the few mullioned windows that existed would have been glazed. The biggest change to its status must have occurred in the C18th or C19th century. It is easy to imagine the fall in fortunes of the owner or, maybe the whole community; a gradual decline before the final ignominy of being reduced to half its original size and converted into two tiny cottages; no longer a house of substance but two humble dwellings for the labourers. 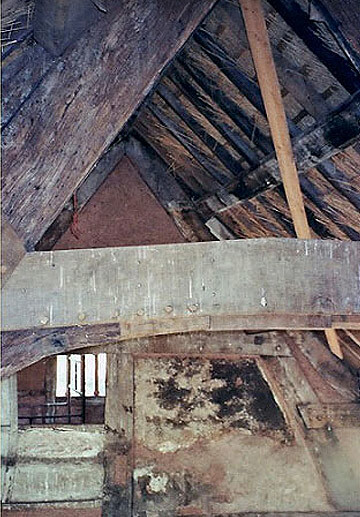 The third and possible fourth bay having disappeared for whatever reason, the graceful, arched centre bay truss became the end of the building and exposed to the elements. The timbers of the West wall were cut off at head height and two crude fireplaces inserted in the sandstone infill, chimney stacks didn't even reach above the eaves. The 1861 census records it as being occupied by two families. Here say has it that ten children were raised in the two cottages in the early C20th century. From then until the 1960’s, when it was used to store apples, we know nothing about. When it came into our ownership the roof had gone from the NE corner and the first floor had collapsed. The bottom plates were sinking into the ground and with the gutters gone the wet was doing its thing to the rest of the building. 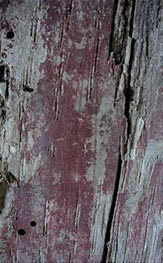 The red oxide on the cross frame. After so nearly losing the building completely it has now come full circle, back to its former glory – with a few mod cons added of course; a traumatic but relatively short period in its long history. Just another phase it is going through passing into the future. Catch it while you can.